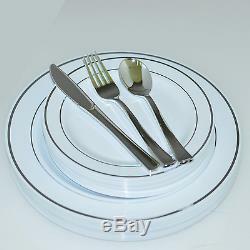 Premium quality plastic white or cream plates with gold/silver or rose gold line design. Each pack contains exquisite 7.5" plates, 10.25" plates and cutlery (forks, knives, spoons) to match. Comes in 4 different quantities: 40, 80, 120 and 200 count. Reflective design gives the setting a brilliantly sophisticated look. Hand wash and reuse or simply dispose of after use for easy clean-up. These elegant tableware features a beautiful line design in gold/silver or rose gold metallic trimming. Designed to look like real China, but priced that they can be used as a disposable, these are a must-have for any formal affair. Your guests will not believe it's plastic! 10.5'' premium plastic dinner plates (choose color). 7.5 premium plastic salad plates (choose color). The item "Dinner/ Wedding Disposable Plastic Plates & silverware silver/gold/rose gold rim" is in sale since Monday, May 22, 2017. This item is in the category "Home & Garden\Greeting Cards & Party Supply\Party Supplies\Party Tableware & Serveware". The seller is "factorydirectparty" and is located in Pittston, Pennsylvania. This item can be shipped to United States, Canada, United Kingdom, Denmark, Romania, Slovakia, Bulgaria, Czech republic, Finland, Hungary, Latvia, Lithuania, Malta, Estonia, Australia, Greece, Portugal, Cyprus, Slovenia, Japan, China, Sweden, South Korea, Indonesia, Taiwan, South africa, Thailand, Belgium, France, Hong Kong, Ireland, Netherlands, Poland, Spain, Italy, Germany, Austria, Israel, Mexico, New Zealand, Philippines, Singapore, Switzerland, Norway, Saudi arabia, Ukraine, United arab emirates, Qatar, Kuwait, Bahrain, Croatia, Malaysia, Brazil, Chile, Colombia, Costa rica, Dominican republic, Panama, Trinidad and tobago, Guatemala, El salvador, Honduras, Jamaica, Bahamas, Viet nam.